Overused phrase or not, time flies. Really. It does. Case in point, while walking through a bar here in Austin earlier today (shocker! ), I noticed the Scottish Open golf tournament on one of the flat screens. That mere sight jarred my memory that it’s already been 10 years ago this week since I took a journey of a lifetime, living out a dream, and heading to the birthplace of golf, St. Andrews, Scotland, to play the famed Old Course, where the game of golf began way back in 1552, according to the earliest surviving document. 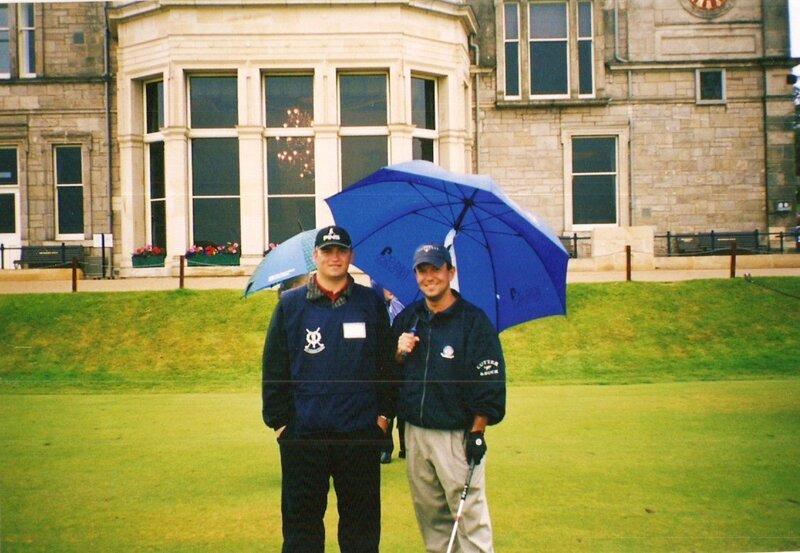 While already in the midst of an amazing trip traveling through Ireland during July 2002, meeting up with best buddy, Erik Michielsen, I departed our agenda of mayhem in Galway, took a bus across the Emerald Isle back to Dublin and hopped a quick flight over the Irish Sea to Edinburgh. 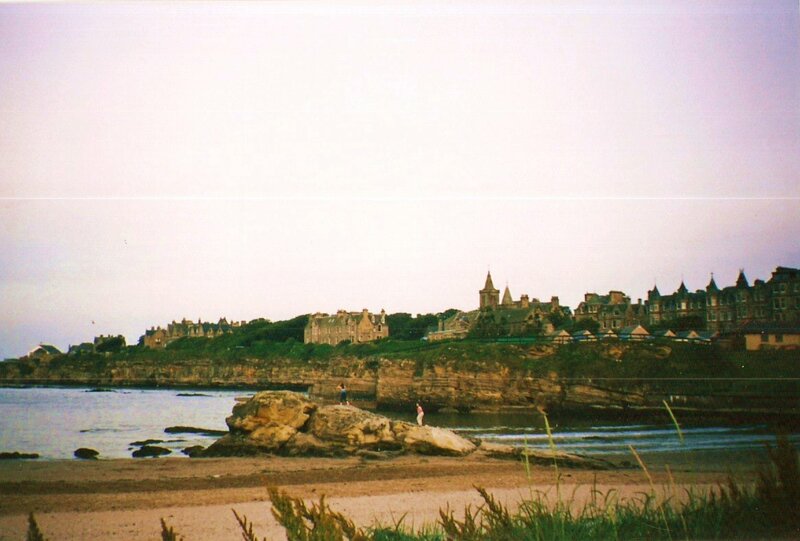 Not fully comprehending the reality of what I was embarking upon, let alone where I was heading, I grabbed my lunch box-sized rental car and headed up the northeast coast of Fife to the home of golf, St. Andrews, located a mere 55 miles from Edinburgh. 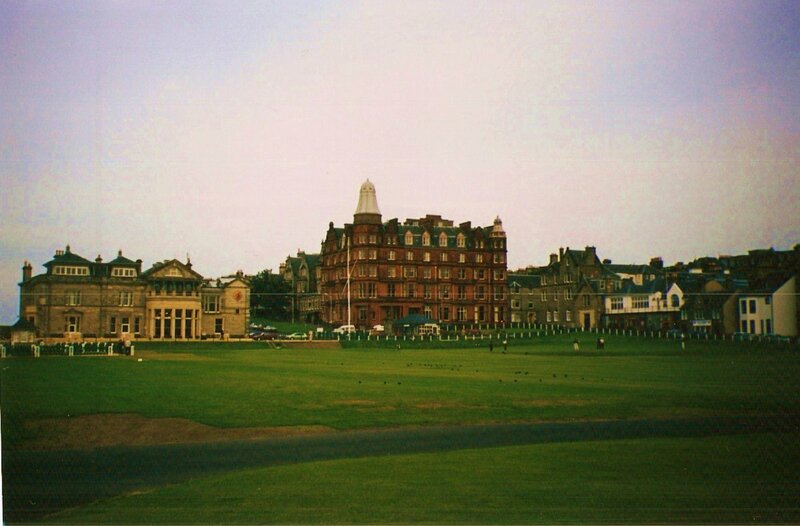 Upon reaching St. Andrews, I will just say, I was in complete awe. 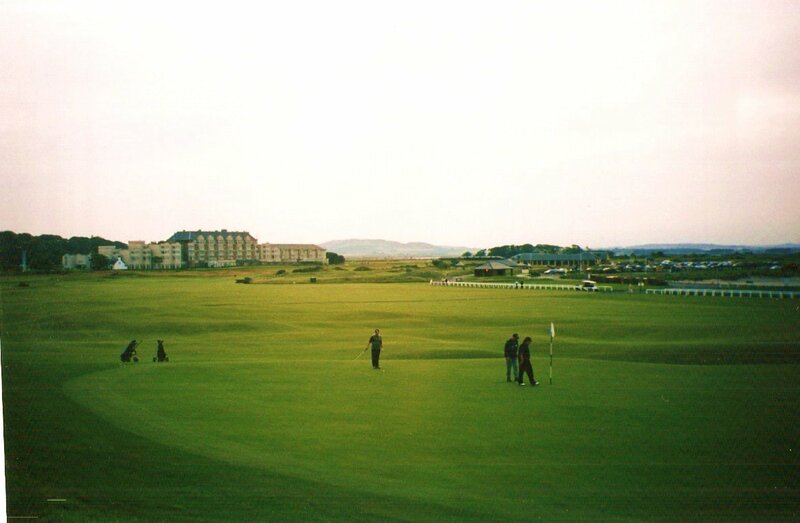 Having dreamt of the vision of the Old Course, its surrounding buildings and grounds since I first started swinging a golf club at the age of 12…now, here I was…in the heart of it all. An amazing sight, to say the least. 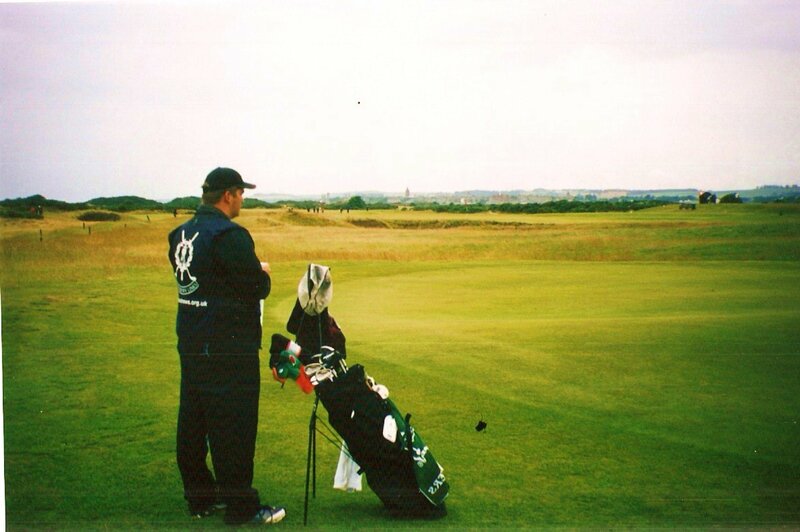 Following a night sauntering around various pubs and local dives in St. Andrews, testing the finest scotches I’d ever experienced, and meeting fellow golfers from around the world, all congregating in this small village for the same reason, I readied myself for the golf round of a lifetime the following morning. An early rise at 5am to get my name on the somewhat lengthy “waiting list” at the Old Course Starter’s Box, in hopes of making a dream come true, the increasing anticipation and suspense finally lifted at 6:30am, when my name was called and I was informed that I would, indeed, get the chance to chase the little white ball around the hallowed grounds. The amazing experience on the Old Course officially begins at 7am, when I am paired with a father and son from North Carolina and an Englishman, along with my trusty caddy, Neil, as seen above. Naturally, it’s a chilly, misty day along the North Sea and I wouldn’t have had it any other way. Simply perfect. And for the golfers in the audience, due to the conditions, I played the entire 18 holes at the Old Course with only irons out of the bag. 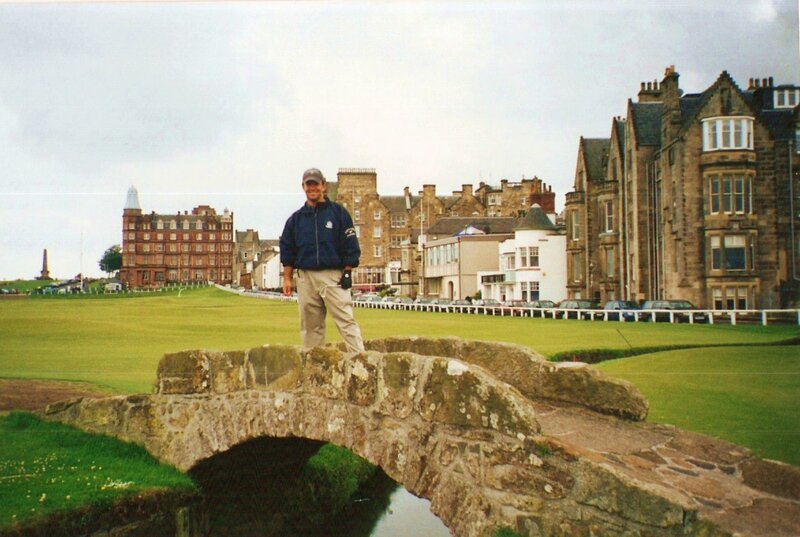 “Just keep the ball low,” urged the man, the myth, the legend, now known as my St. Andrews caddy, Neil. Needless to say, every step I took throughout the journey around the Old Course was unbelievable, relishing every second, taking in every site, every angle and thinking of all the history that had occurred along these same lands over the centuries. As for my performance, itself, not bad at all, considering the nerves and anxiety of teeing it up here. Broke 90. Had some pars, some great shots. Some not so pretty. This is the game of golf, after all. And, yes, there were many epic moments and, now memories, to be had, as well. Legendary. Dunked a ball in the water of the Swilken Burn on the 1st hole. Putt from the fairway and across double greens. Hit the side of a building with my tee shot on 18, only to have’er end up in the middle of the fairway, where, after crossing the famed Swilken Bridge, I saved par to finish. However, the best memory during the round is the moment at the massive pot bunker, size of Rhode Island, on the par-5 14th Hole called, “Hell,” which I can now confirm is perfectly named. After a wayward tee shot, I approached the massive wall of earth – at least 10 feet high – with my golf ball plugged in the sand beneath. One look at my predicament and my caddy, Neil, plain-faced and dead-on, says, “You’re f**ked.” Classic. I thought I knew better. Aimed the way I wanted – directly over the bunker wall – and hit toward the hole. Finished the hole with a very generous 10. Trust your caddy. 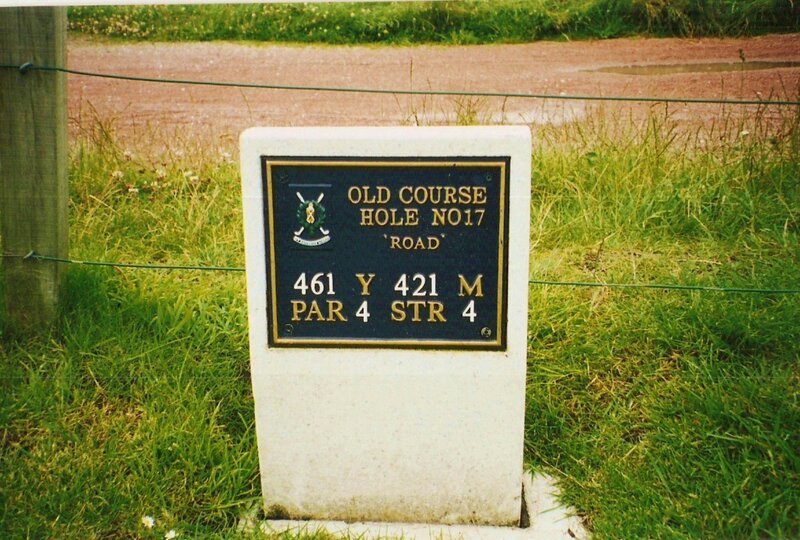 All in all, the round at The Old Course is and will remain, far and away, the most incredible experience I have had playing golf. I cannot say enough for the entire journey and every moment from tee to green at the legendary links. I sincerely hope, if you love the game as I do, that you will also get to live out the dream of playing where the sport was first born. 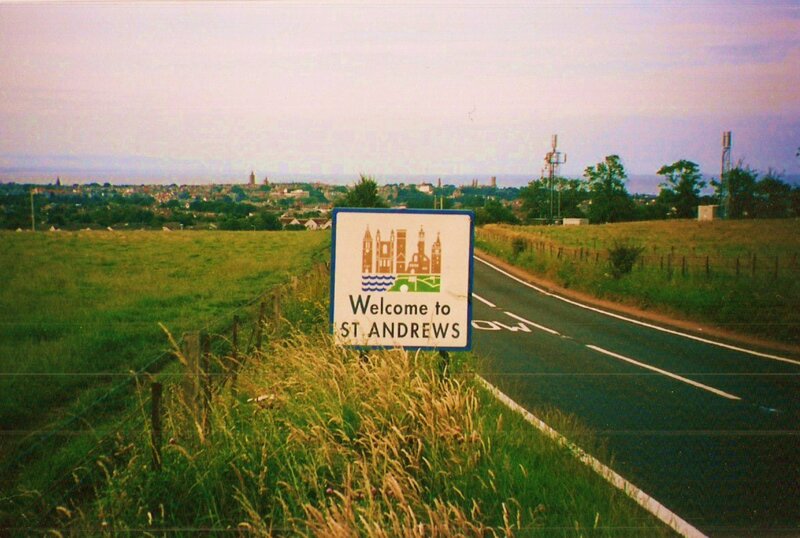 At St. Andrews.